About February, someone flipped the switch on the Ventura County real estate market and it has taken off like crazy. Since then it seems that everyone who has ever talked to me about buying a home in the last couple of years is ready to buy now! I’m not complaining….not at all, but all of this intense real estate activity has really cut into my photography time. 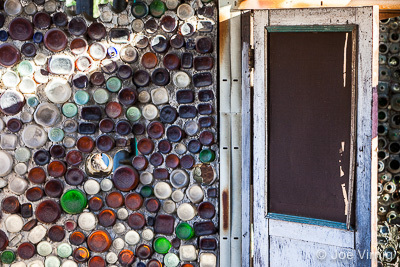 So when I got an email last week that Grandma Prisbrey’s Bottle Village in Simi Valley would be open for a couple of hours on Sunday to a limited number of photographers, I jumped at the chance. 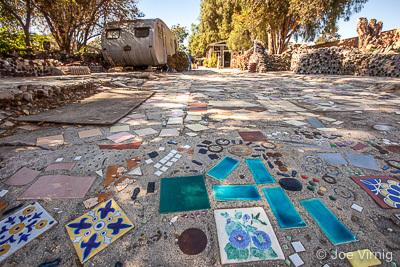 My knowledge of Bottle Village was limited to a few photographs I’d seen and the articles I had read in the newspaper about the damage it sustained during the Northridge Earthquake in 1994. It had been closed to the public even before that, since1984, so this was the first opportunity I had to see it for myself. First a little background on Bottle Village might be necessary. I’ve told a number of people now about my visit and so far not one of them had ever heard of it. My sample was admittedly limited just to people who live in West Ventura County, but no one…really? I think the fact that Bottle Village has been out of the public eye for a generation has made it almost unknown to anyone outside those who live or have connections to Simi Valley. 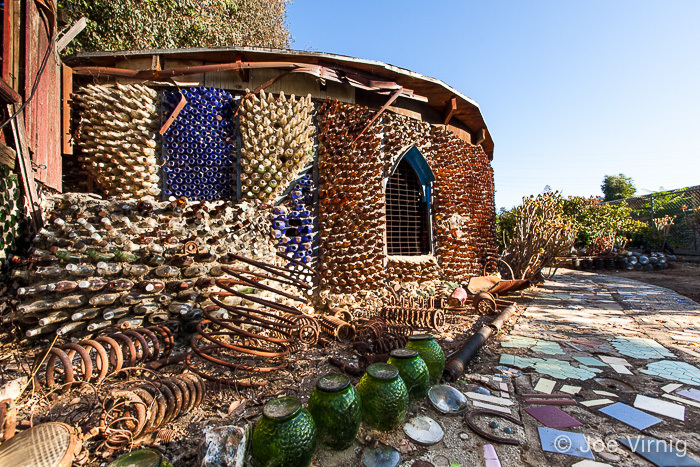 The Cliff's Notes version of Bottle Village history is that in 1956, at the age of 60, Grandma Prisbrey purchased the lot at 4595 Cochran Street in Simi Valley and over the next 25 years created one structure after another made from bottles and all manner of objects that she collected from the local landfill. Wikipedia has a more in-depth history here. 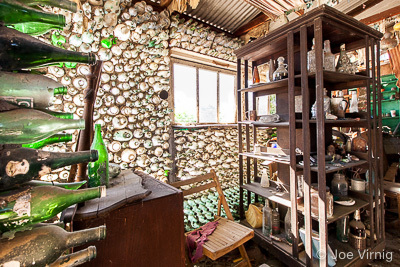 Is Bottle Village a wonderful example of folk art created by a visionary recycler or the biggest collection of building code violations ever assembled on a single lot in Ventura County? Maybe both! But whatever it is, it is a fascinating place to visit. How does one describe Bottle Village? First of all…it’s a lot to take in. From the moment you step onto the property there is an overwhelming amount of detail. 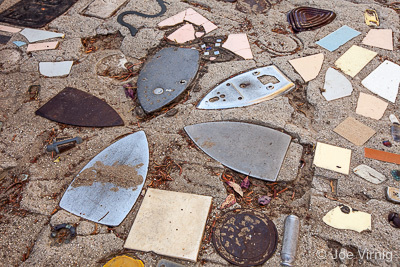 Paths are imbedded with mosaic tiles and just about anything else one could possibly imagine…license plate frames, car emblems, irons, pistols…the list could go on forever. Then there are the planters made from car headlights, walkways lined with television tubes and, of course, the buildings. 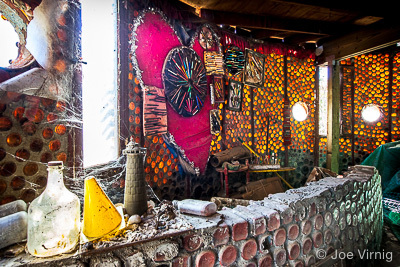 Buildings made from discarded bottles and the imagination of Grandma Prisbrey. In the center of all of this madness and wonder still sits the travel trailer where Grandma Prisbrey lived while she created Bottle Village. 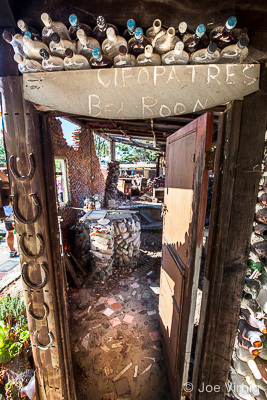 Everywhere is evidence of dramatic damage from the earthquake and the more subtle damage from the ravages of time. As I wandered the grounds and explored it with my camera I tried to imagine what it might have looked like in its prime. At this point it seems more like a ghost town, slowing decaying and forgotten. 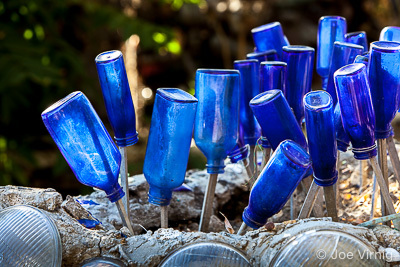 That feeling was reinforced later that evening looking at old photos of Bottle Village I found searching the Internet. 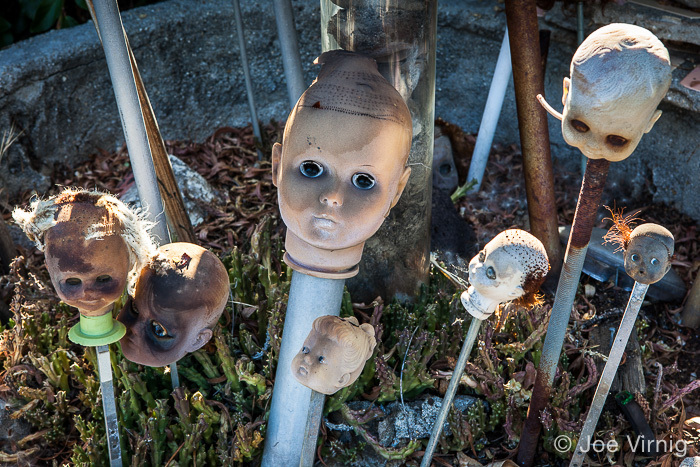 Those photos showed the interiors decorated everywhere with dolls, pencils, photos and all manner of items. The place was vibrant, alive and chaotic! One photo even showed Grandma Prisbrey, herself, in the distance tending to her creation. I could almost imagine what it must have been like back then when Bottle Village was in its prime. 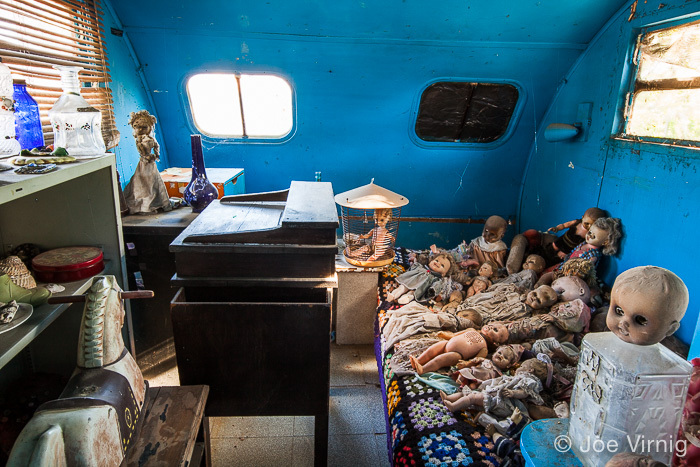 Many of the dolls and other chotchkes that once decorated the insides of the various structures were now stored in Grandma’s trailer. The trailer door was open and I went inside her tiny home and took some photographs of the items stored in her bedroom. As it turns out, they hadn’t really meant for us photographers to take pictures inside the trailer since they didn’t want anyone to think Grandma Prisbrey slept with dolls or painted her trailer turquoise blue. (Grandma Prisbrey was eccentric, not crazy after all!) The turquoise paint, a volunteer told me, had been applied by a caretaker after Grandma Prisbrey’s death that may or, may not have been, a little odd and taken a few liberties with the place. During my later search for photos on the Internet, I came up with a few that featured a woman and a young man who were described as caretakers by the photographer. Unbidden to my mind came a scene from the “Rocky Horror Picture Show”. The rest I leave to your imagination. I have to say I thoroughly enjoyed the two hours I spent taking photographs and I hope to return again. For more information on Bottle Village in Simi Valley visit BottleVillage.com or the Bottle Village Facebook page.